When considering Glacier National Park day hikes, this is one of the most popular hikes in the park. It follows the western edge of the Continental Divide providing spectacular vistas. This is a moderately easy trail given there is very little elevation gain for the first 7 miles. The trail starts off passing through a subalpine meadow with twisted subalpine fir and Engelmann spruce. After ½ mile or so, the trail winds along a sheer cliff where you’ll get spectacular views of the Logan Creek valley, Mt Clements, Mt Oberlin, and more. It continues northward through stands of subalpine fir and then emerges into alpine tundra covered with fields of wildflowers and gushing streams. Along here you get fantastic vistas of Heavens Peak and other beautiful landscapes. The trail then climbs gently over Haystack Butte where you’ll cross barren rocky slopes and alpine meadows before it drops down into Granite Park Chalet. From Granite Park Chalet, it descends quickly and switches back down through the 2003 Trapper Creek fire burn ending at The Loop. The Garden Wall Trail is 11.6 miles long, however, you can choose to make it shorter by hiking in 2 to 3 miles through the wildflowers and then return to Logan Pass. Because of the popularity of the first 3 miles of this trail, there will be many hikers. But once you pass this 3 mile point, the number of hikers on the trail will decrease substantially. You can anticipate seeing a variety of wildlife along this trail. Mountain goats, bighorn sheep, marmots, picas, and Columbian ground squirrels to name a few. You may also have the opportunity to see a grizzly bear in one of the distant alpine meadows so bring your bear spray. If you’re looking for uncrowded Glacier National Park day hikes, this one fits the criteria and one of the best. It starts and ends at Bowman Lake. Because you will pass over 2 mountain ridges, this trail is moderately difficult. But as you crest each ridge, you will have great views of the Quartz Creek Valley and the Livingstone Range. We suggest you hike this loop trail counter clockwise – opposite from Glacier Park’s suggestion – making your descents less steep than your ascents and therefore less stress on your knees. This trail starts at the foot of Bowman Lake where you’ll cross a wooden foot bridge over Bowman Creek and pass through a heavily wooded forest for roughly ½ mile to a fork. To take the route we suggest, you will take a right at the fork where you’ll continue through the forest and head up a fairly steep incline for 1½ miles to the top of Quartz Ridge. From here you’ll look down over and descend through the 1988 North Fork Fire burn into the Quartz Creek valley. Because of the burn, you’ll experience great views of Logging Mountain and the Livingston Range. At the bottom of your descent, you will cross a wooden foot bridge over Quartz Creek where you’ll find a backcountry campground and picnic area next to Lower Quartz Lake. You’ll then hike along Lower Quartz Lake and through the forest to the shallow Middle Quartz Lake. Here, the trail goes between Middle Quartz Lake and Quartz Lake, crossing another wooden foot bridge over Quartz Creek and passing by a Glacier Park backcountry cabin and another backcountry campground. You’ll then have a fairly steep ascent through the 1988 North Fork Fire burn to the top of Cerulean Ridge. While ascending this ridge, take time to turn around to catch views of all 3 of the Quartz lakes and the Livingston Range. This route also passes through some great Huckleberry patches, which are great for eating when ripe. Once you reach the top of Cerulean Ridge, you’ll descend back through the forest into the Bowman Lake valley where you come back to the fork. Hike the last ½ mile to the foot of Bowman Lake to complete this loop trail. The Quartz Lake Loop Trail is 12.8 miles long. When you hike this trail, even during the height of the summer tourist season, you’ll encounter very few hikers. This makes it one of our favorite Glacier National Park day hikes. Mostly along this trail you can anticipate encountering deer and birds. But be prepared for a chance encounter with a grizzly or black bear so carry your bear spray. To access this trail, you will travel the mostly gravel North Fork Road, or Route 486, to Polebridge where you will enter Glacier Park. Just after you enter Glacier Park, turn left and you will see the sign for Bowman Lake. This road into Bowman Lake is a two track dirt road so don’t be in a hurry. At Bowman Lake, you’ll find parking in the day use area which is where you’ll also access the start of the trail. This Glacier National Park day hike is a short offshoot from the Gunsight Pass Trail. It passes through a wooded forest with heavy underbrush and has little elevation change except for the relatively steep descent at the beginning of this hike which you’ll climb back up to finish this hike. Because of this steep encounter, I’m rating the trail moderate. 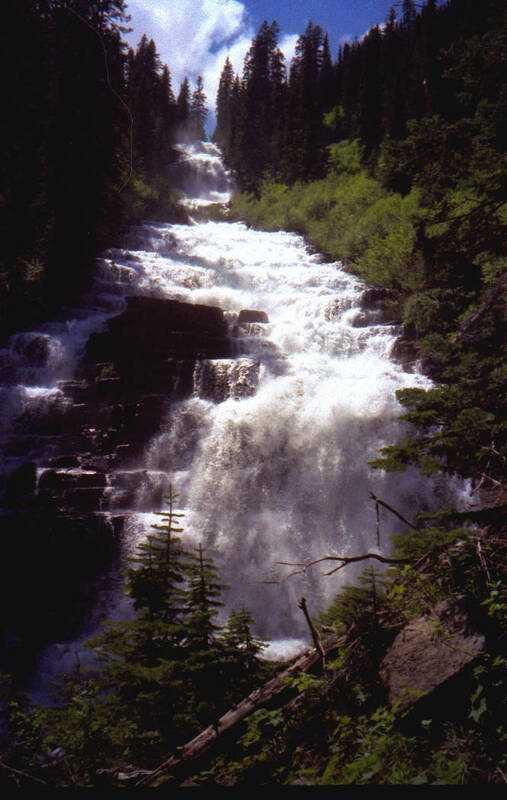 Florence Falls is one of Glacier Park’s hidden treasures and one of the largest falls in the park. It tumbles down a cliff of more than 100 feet on rock stair steps into a crystal clear pond. The trail starts from the eastern end of the Jackson Glacier Overlook parking area where the trailhead will be marked Gunsight Pass Trail. It descends steeply, about 650 feet within 1½ miles, through the forest down to Deadwood Falls and into the Saint Mary River valley. A little further down the trail you’ll come to the intersection with the Saint Mary Falls trail. Take a right onto the Gunsight Pass Trail where you’ll cross over Reynolds Creek on a suspension foot bridge. This trail will meander through the forest with heavy underbrush of thimbleberry and cow parsnip – prime grizzly bear habitat. You will come to an opening in the forest at Mirror Pond where you’ll get an incredible view of Mount Jackson, Gunsight Mountain, and Fusillade Mountain. At roughly 4 miles you’ll reach the junction with the trail to Florence Falls. Take a right onto this trail. You’ll hike the last .8 miles through more forest with thick underbrush – sometimes being difficult to see the trail – to the base of Florence Falls. Climb up the hillside below the falls where you’ll be rewarded with a view of the entire falls. Florence Falls Trail is 9.6 miles long round trip. This is another trail where you’ll see very few hikers. You will definitely want to bring your bear spray as you’ll be in prime grizzly bear habitat, and don’t forget your mosquito repellent either. We hiked out of Florence Falls in record time because we forgot our mosquito repellent. To access this trail, you will travel the Going-To-The-Sun Road to the Jackson Glacier Overlook parking area roughly 6 miles east of Logan Pass. There is usually not problem finding parking here. Because we thoroughly enjoy the uncrowded Glacier National Park day hikes, Trout Lake Trail is another favorite. Trout Lake Trail passes through the 2003 Robert Fire burn (passing through a fire burn is not always a disadvantage). Once the area has burned, the forest is opened up for many vistas you otherwise wouldn’t get. The lake is a beautiful aquamarine mountain lake and earns its name by providing great Cut Throat Trout fishing (fly fishing only). The trail starts at the northeastern shore of Lake McDonald and climbs steeply where you’ll soon cross a rushing stream. About halfway up, glance backwards to get a view of Lake McDonald and the mountain peaks on the other side. You’ll continue to climb until you reach the top of Howe Ridge where you’ll intersect with the Howe Ridge Trail. At this point you descend steeply into the Camas Creek valley. Shortly before you reach the valley floor, you’ll intersect with the Camas Creek Trail. Take a right onto the Camas Creek Trail to the foot of Trout Lake where there will be a picnic area and enjoy have views of Rogers Peak and other peaks of the Camas Ridge. As you walk the relatively flat trail along the south shore of Trout Lake, you’ll get vistas of Stanton Mountain and Mount Vaught, and can continue to Arrow Lake. Whether you toss a dry fly in the water or cool your overheated toes, this is a great place to relax and get away from the crowds. The Trout Lake Trail is 7 miles long round trip to the foot of Trout Lake. You can extend this day hike by hiking along the lake or even go to the Arrow Lake campground at its foot – roughly another 7 miles round trip. You will see very few hikers along this trail. You can see deer, bear (both black and grizzly), and a variety of birds and small critters along this trail. To access this trail, travel ½ mile past Lake McDonald Lodge on the Going-To-The-Sun Road. Turn left on the North Lake McDonald Road where you will cross McDonald Creek. The pavement will end shortly after the bridge and continue past the Lake McDonald Ranger Station for about ½ mile where the road opens up for parking. This is where you’ll find the trailhead mark for Trout Lake. Always remember to go prepared when hiking in Glacier National Park. Dress appropriately and in layers for the cool mornings but warm afternoons. Take a day pack and carry plenty of water, snacks, and trail lunch. It is not safe to drink the water from the creeks and lakes. Rain gear is always good for the changing weather conditions in Glacier Park. Some first aid items include; bandages, sun screen, blister protection, etc., and bear spray in the event of an unlikely aggressive bear encounter. A compass and map if you should accidentally take a wrong turn. Binoculars to search out distant birds and critters. And of course, your camera to record the great vistas and any wildlife encounters. For information on some of our favorite shorter day hikes see out post Glacier National Park Day Hike (Short Hikes).